Olympia City Hall is located at 601 4th Avenue E, Olympia, WA 98501; phone: 360-753-8447. Photo: The Hale House (Captain Calvin Henry Hale and Pamela Case Hale House), ca. 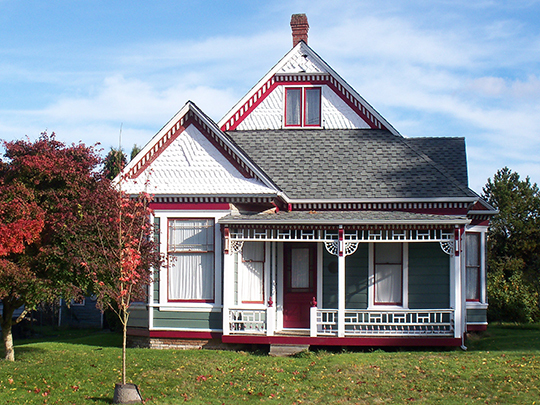 1882, 902 Tullis Street NE, Olympia, WA. Listed on the National Register of Historic Places in 1984. Photograph by User:Ingmanjc (own work), 2011, [cc-by-3.0 (creativecommons.org/licenses/by/3.0)], via Wikimedia Commons, accessed March, 2014. Olympia, State Capital and seat of Thurston County, spreads fan-like from its harbor on Puget Sound over gently sloping hills, with Mount Ranier on the east and the more distant Olympics visible to the north. Here, near the place where Nisqually once met in solemn council to devise means of protection against the soleeks itsweet (angry brown bear), today legislators convene to represent the citizens of the State named in honor of the Great White Father. From a broad knoll near the center of the town rise massive white sandstone buildings of the Capitol Group, with the tall white dome of the Legislative Building conspicuous for miles around. In general, Olympia has an atmosphere of conservatism and moderate prosperity. Modern buildings predominate in the small, compact business district, while residential areas represent an older architectural mode, quiet and attractive, with substantial homes, smooth lawns, and long colonnades of shade trees. The Pacific Highway bisects the city, giving a glimpse of practically every phase of activity and a panoramic view of the surrounding mountains and harbor. Southernmost port on Puget Sound, Olympia is the center of an industrial area concentrated along the water front, where the Deschutes River flows into Budd Inlet. Sawmills and woodworking plants, knitting mills, and oyster-packing houses cover the area between the east and west bays. Government employees of city, county and State constitute a substantial part of the residents. The days of such citizens are for the most part well-ordered in the long-established routine of their work, and the city reflects in some measure a placid mood and economic stability. But being a capital city, Olympia is greatly influenced by shifting political winds and registers recurrent changes in tempo in the life of its population, as the legislature convenes and disperses or State administrations change. With the convening of the legislature, an air of hurry and bustle pervades the city. Legislators, their family, friends and attendant lobbyists come and go; the hotels fill, and restaurants and shops do a thriving business; groups of people, generally engaged in political discussion, gather in lobbies, in capitol corridors, on the street; visitors throng the galleries as lawmakers deliberate; traffic is thick on Capitol Way. The history of Olympia goes back to 1848, when Edmund Sylvester, a Gloucester fisherman, and Levi Lathrop Smith, a Presbyterian divinity student, came to the region, called by the Nisqually tribe stechchass (place of the bear). These strangely associated partners each secured a 320 land grant from the Oregon Provisional Government. The former chose Chamber's Prairie; the latter, the south shore of Budd Inlet. They agreed that, upon either's death, the survivor would become heir. They adopted for their lands a composite name, Smithter—later modified by usages to Smithfield. In 1845 a group of five settlers under the direction of Michael T. Simmons had arrived at nearby Tumwater. Eight of the new arrivals planned and built the first saw mill of the region near the northwestern part of lower Tumwater Falls. With the arrival of Father Pascal Ricard and nine Oblate fathers in June, 1848, St. Joseph's Mission was established on Budd Inlet. The site, today called Priest's Point, a beautiful wood park overlooking the bay, is the city's principal playground. Accident decided which one of the two founders should succeed to control the site; Smith, which traveling by canoe to the sessions of the Oregon Provisional Government [see State of Oregon], suffered an epileptic attack and was drowned when his craft capsized. Under the Oregon Provisional Land Laws, Sylvester became the owner of Smith's claim—the present site of Olympia. The village was practically depopulated during the California gold rush of 1849. Even Sylvester succumbed to the hope of striking it rich, but it was not long before this hope grew dim. Disappointed and homesick, he joined with several others in the purchase of the brig Orbit and set sail for Budd Inlet, arriving there on New Year's Day, 1850. Later, the Orbit sailed to San Francisco with a cargo of piling and returned with a supply of sugar, clothing, and miscellaneous supplies for the shelves of a small general store, the first in the region. Congress authorized the establishment of a custom-house in the growing village in February, 1851, thus creating the first port of entry on Puget Sound. S. P. Moses was appointed collector, and five months later the first mail contract was let to A. B. Robbeson for service by horseback and canoe between Smithfield and the Columbia River settlement. Inspired by the magnificent panorama of the Olympics, Colonel Isaac N. Ebey, who succeeded Moses as collector of customs, persuaded Sylvester and the townsfolk to rechristen the village Olympia. A townsite was platted and the lots were put up for sale. In close succession a series of memorable events occurred. In 1852 George A. Barnes opened a general merchandise store at the west end of First Street, the first sessions of a district court were convened in the custom-house; the Columbian was established with T. F. McElroy and J. W. Wiley as publishers; stage service to the Columbia River region began; and in December, the Reverend Benjamin Close delivered a sermon to the first Methodist congregation. Two years later, Presbyterian services were conducted in a cooper's shop by the Reverend George Whiteworth, and the first church edifice in the region was erected by Roman Catholics in 1854. In 1853 agitation for the separation of the territory north of the Columbia got under way, and the Columbian was a powerful factor in developing public sentiment. The campaign was successful, and the new territory was created and named Washington in March, 1853. So slowly, however, did dispatches travel from Washington, D.C., that the Columbian continued its urgent editorials for some weeks after the new Territory had been created. Major Isaac I. Stevens, appointed Territorial Governor, arrived November 25, 1853, and on November 28 proclaimed Olympia the Territorial capital. Then he launched vigorously into the problems of the new commonwealth. The first Territorial legislature was convened in 1854.